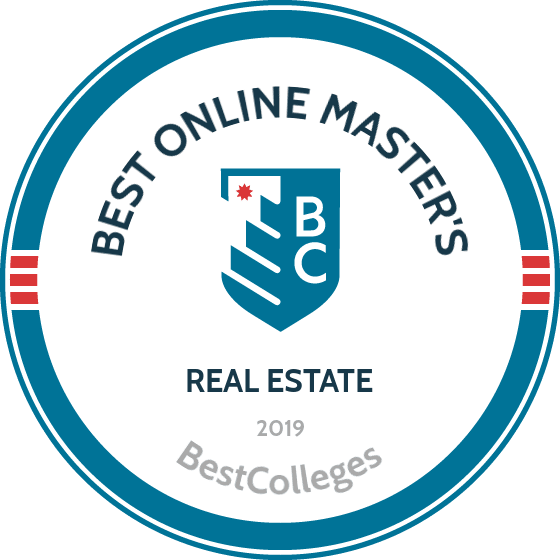 What Are The Best Online Master's in Real Estate Programs? What Else Can I Expect From an Online Master's in Real Estate Program? Individuals who earn a master's in real estate gain access to a wide range of career options in the field. Graduates can go on to run their own real estate and property management firms or serve as developers of new commercial, residential, and industrial properties. Most jobs in this field are projected to grow at a rate close to the national average. Additionally, according to PayScale, experienced real estate developers can earn especially high salaries. Earning an online graduate degree in real estate is a good step towards pursuing an exciting and lucrative career. Georgetown University offers 10 distance education programs, including an online master of professional studies in real estate. Students earning the online master's degree in real estate gain leadership skills, an understanding of collaborative ethics, and industry knowledge. Students prepare for careers as construction project managers, real estate developers, and commercial real estate lenders. The curriculum comprises 33 credits and includes four foundational classes. Students examine property laws and the issues that arise from the development, ownership, financing, and management of real estate. Learners also study real estate finance and accounting, exploring topics such as capitalization rates and valuation methodologies. Students learn to evaluate diverse real estate markets by applying theoretical frameworks and analytical tools. Learners personalize their online master's degree in real estate through four guided electives. Options include multi-family and affordable housing, the impact of globalization on real estate, and sustainable development and construction. The program culminates in a capstone course, during which students conduct extensive research under the guidance of a senior real estate professional. Students write a 50-page paper and present their findings to faculty and peers. Georgetown offers fall, spring, and summer enrollment dates, with priority application deadlines on March 1, October 15, and February 15, respectively. Applicants must have a bachelor's degree and a minimum 3.0 GPA, and they must submit a statement of pursue, a resume or CV, and two recommendation letters. All online students pay the same affordable tuition rate, regardless of residency, and distance learners can qualify for financial aid. Based in Miami, Florida International University delivers 40 remote graduate programs, including a 30-credit online master of science in international real estate. Students learn to lead clients and team members through real estate analysis, valuation, and financing. They also prepare to close property deals while adhering to government regulations and industry best practices. The program readies students to occupy leadership roles and earn industry credentials, such as the highly respected ARGUS certification. The curriculum includes two core classes in corporate financial management and global real estate capital markets. Students in the latter course examine mortgage-backed securities and the markets for structured real estate debt. Additional coursework covers real estate development, finance, and market analysis. Students earning the master of science in real estate online explore real estate law and learn what it means to sign a purchase contract and how to lucratively buy and manage their own properties. Unlike other online real estate master's programs, the FIU program emphasizes a global perspective. Courses cover topics including legal constraints on land use, global financing, foreign exchange risk, and shifting cultural norms toward property ownership. Students complete a special topics course in lieu of a capstone. FIU delivers online courses through Canvas in a cohort format, which provides opportunities for students to collaborate with peers and professors. Candidates take two asynchronous courses during each eight-week block and graduate in as few as 10 months. Applicants must have a bachelor's degree and a minimum 3.0 GPA. Florida State University was founded in 1851 and is the oldest continuous higher education institution in the state. The school offers more than 360 academic programs, including an online master of business administration with a real estate specialization. The program emphasizes finance and real estate analysis. Distance learners take asynchronous classes through Blackboard, and most students graduate in two years. The curriculum comprises 39 credits, including nine general business courses. Classes cover topics including organizational behavior, operations management, and the legal and ethical environment of business. Students learn to conduct business conditions analyses, using statistical software to forecast major economic fluctuations. The core curriculum also includes a strategy and business policy class, in which learners study theories and methodologies used to inform strategic decision-making. The master's in real estate online program includes three specialized courses in valuation, finance, and investment. Students round out their training with a guided elective; options include business-to-business marketing, risk and insurance fundamentals, and investment management and analysis. Students can also take a global business seminar to learn about international culture and organizational practices while travelling abroad. Candidates apply for fall, spring, or summer admission, with respective deadlines on the first of July, November, and March. Applicants must hold a bachelor's degree and a minimum 3.0 GPA. Applicants must submit GRE or GMAT scores, a current resume or CV, a professional statement, and two recommendation letters. Florida residents pay lower tuition rates than out-of-state students. Established in 1864, the University of Denver is the oldest private higher education institution in the Rocky Mountain region. The school enrolls more than 11,700 students and delivers distance education programs through Canvas. Distance learners can pursue an online executive master of science in real estate and the built environment. The holistic curriculum helps students develop the business acumen, management training, and leadership skills to tackle a full project. The online master's degree in real estate requires 48 credits. Coursework covers topics including income property finance, construction building systems, and the business of the built environment. Students learn to manage integrated, multidisciplinary teams by applying a strategic intelligence and leadership model. The remaining credits comprise guided electives, which students can use to earn a concentration in real estate, property development, or integrated project delivery. Distance learners who concentrate in real estate study topics such as income property investments, advanced valuation and report writing, and ARGUS financial analysis. Students can work with a faculty adviser to choose electives that prepare them to earn professional designations, such as the certified property manager or certified commercial investment member credentials. Online learners take synchronous courses and attend a three-day campus residency. Most students earn the degree in 18-24 months. Although DU has no set GPA requirement, the average applicant has a 3.25 GPA. Applicants must submit GMAT or GRE scores and three essay responses, and all students in the program pay the same flat tuition rate. The university offers ample financial aid opportunities, including merit scholarships, graduate assistantships, and endowed awards for students who are part of underrepresented populations. Based in Henniker, New Hampshire, New England College enrolls 2,700 students in 50 academic programs, including an online master of science in management with a concentration in real estate management. Students develop skills in leadership, logistical concepts, contract negotiations, and project management. The comprehensive program prepares students for positions with real estate investment banks, regulatory agencies, and international real estate development firms. The 36-credit curriculum comprises 10 classes and a project or thesis. Core coursework covers topics including research methods, strategic planning and policy, and professional and organizational ethics. Classes in the real estate management concentration address fundamental topics including accounting and finance. Students also learn to conduct feasibility analysis and valuation. They examine forces behind the demand for real estate development and learn to identify possible regulatory, legal, and political challenges. Students earning a master's in real estate online complete a strategic capstone during which they apply business knowledge and research skills to either develop a real estate program or provide organizational solutions to an issue in the field. NEC delivers online coursework through Blackboard and offers six terms per year. Students who take two courses per term can graduate in as few as 12 months, depending on the nature of their capstone project. NEC evaluates applications holistically and considers each candidate's experience and accomplishments. The university does not require GRE or GMAT scores. All distance learners pay the same affordable tuition rate, regardless of residency. Transfer students can apply up to six previous credits toward the degree. No two online real estate programs are exactly the same, but most top schools and programs share common courses. The details of your program depend on the school's location, the program's focus, and how instruction is delivered to online students. While curriculum-related details vary depending on several factors, below are some common courses you can expect to complete while earning a real estate master's degree online. Fundamentals of Real Estate: This course focuses on the income-producing components of commercial and residential real estate, including the processes and mechanisms used to evaluate properties and conduct transactions. Key topics of discussion include entitlements, financial restructuring, site selection, and cash flow. Development Project Management: Students engage in all aspects of managing development and construction projects, from inception to delivery. Common discussion topics include scheduling, budgeting, managing subcontractors, cost control, and value engineering. Real Estate Taxes and Accounting: This course focuses on the various tax credit programs associated with the real estate industry. Students also learn about state and federal incentive programs, synthetic leases, deal structures, energy credits, and appraisal and valuation. Introduction to Real Estate Law: Distance learners gain a basic understanding of the laws and regulations affecting the real estate industry. This includes an examination of the development process and the common issues and challenges real estate agents, brokers, and developers encounter. Sustainability in Real Estate: Building codes, incentive programs, and tax credits have made sustainability and energy efficiency important aspects of real estate sales, development, and management. Students learn about best practices in green development, including the standards of the U.S. Green Building Council and similar organizations. How Long Does it Take to get an Online Master's in Real Estate? Several factors impact how long it takes to earn an online graduate degree in real estate. For example, students who enroll in classes full-time typically finish their degree requirements much more quickly than part-time students. Additionally, the format of your program affects the time it takes to complete your degree. If your program utilizes a cohort learning model, you will take most of your classes with the same group of students. This style of teaching tends to emphasize more group work and allows for greater networking with your peers. Alternatively, individually-paced learning provides more flexibility and lets you take classes at your convenience. On average, students take two to three years to earn their master's in real estate degree. Most programs require the completion of 60 credits of coursework, although this may differ somewhat between schools. The regional or national accreditation status of a school is a primary factor to consider when you're searching for a real estate master's degree online program. Regional accreditation is more common and is generally considered to be more rigorous. However, nationally-accredited schools still meet specific standards and tend to often offer more affordable tuition rates. In terms of regional accreditation, you should look for approval from organizations like the New England Association of Schools and Colleges, AdvanceED, Northwest Commission on Colleges and Universities, Middle States Commission on Higher Education, and Western Association of Schools and Colleges. The most common national accrediting bodies are the Higher Learning Commission and the Distance Education Accrediting Commission. Additionally, some real estate programs are accredited specifically by the International Distance Education Certification Center. Two entities maintain standards for and monitor the work of regional and national accrediting agencies: the Council for Higher Education Accreditation (CHEA) and the U.S. Department of Education. The CHEA is an independent nonprofit organization that recognizes 60 accrediting agencies nationwide. It is made up of more than 3,000 American colleges and universities. The Education Department also regulates these agencies and enforces strict standards. Both the CHEA and the Education Department ensure that accrediting agencies uphold their responsibility to certify only those schools and programs that offer meaningful educational experiences to students. By checking the accreditation status of the schools and programs you're considering, you can determine whether or not you should apply. You can visit the websites of the CHEA and Education Department to view a list of all accredited colleges and universities in the United States. A bachelor's degree in real estate or a related field can help you find an entry-level position and gain experience as a broker, agent, or property manager. However, a master's degree allows you to earn a higher salary and secure a more stable career. Below is some data from the Georgetown University Center on Education and the Workforce (CEW) on the unemployment rates in the business world for workers with undergraduate and graduate degrees. As you gain more experience in your real estate career, you can expect to enjoy an increase in your salary. The table below shows that real estate professionals tend to earn considerably higher salaries as they reach the middle and later stages of their careers. Where you work is another factor that influences your wages. While most people think of agents or brokers when it comes to jobs in real estate, many other career opportunities also exist. Professionals in this field are self-motivated, knowledgeable, and comfortable working with people. Success in real estate also means staying on top of recent trends and effectively advising clients on a variety of issues. These professionals help clients purchase, sell, or rent real estate. Many are self-employed and set their own hours. They often make high salaries during peaks in market cycles. Real estate brokers are licensed to run their own real estate firms, while real estate agents usually work for an established company. Real estate appraisers assess various types of properties and often work out in the field. They assign value to buildings, homes, and parcels of land by using a variety of techniques. This is typically done for tax assessments, insurance purposes, or to determine a house's value before it is placed on the market. Professionals in the property management field oversee the operations and maintenance of many different types of real estate, including residential, commercial, and industrial properties. Real estate owners often hire property managers to ensure properties remain in top condition. Managers may also show properties to potential tenants. To be successful in this field, workers must pay close attention to detail, have strong leadership skills, and be able to find creative solutions to a range of unexpected challenges. Construction managers typically work on development sites where they supervise crews and budget/plan projects. Because these individuals decide whether to approve loans for people purchasing homes and other properties, loan officers benefit from advanced real estate knowledge. These professionals usually work for mortgage lenders, commercial banks, credit unions, and other financial services organizations. They must be highly knowledgeable and able to make sound decisions based on data and evidence. As you prepare to enroll in a real estate degree online program it is important to remember that there are many resources to help fund your studies. A good first step is to fill out the Free Application for Federal Student Aid (FAFSA) form to determine if you qualify for financial assistance. You have nothing to lose by doing this and the form takes only a few minutes to complete. You may be surprised by the number of low-interest loans, grants, and/or work-study benefits you have access to. It is also prudent to look for scholarship opportunities, including those related to the real estate field. For example, the Pension Real Estate Association offers scholarships to students seeking a master's in real estate.